Thanks to Clark Goodwin who invited me to breakfast yesterday. It was a TOTALLY AWESOME southern breakfast. Then William J. Morton MD JD (and quite a humorist) discussed his book "The Story of Georgia's Boundaries: A Meeting of History and Geography" It gave me a chance to see Trinity Presbyterian Church in Atlanta. It was a delightful way to start the day. Clark got the sanctuary unlocked for me. I was there alone about 8:45 in the morning, lights off, with my tiny little camera. The major windows are clear, light flooded in. The small windows have what I'd call a "Crook" lattice in stained glass. My overall impression is crisp, bright, open, simple, wide rather than deep. You can see the reflection of a lattice patterned window that's behind me in the narthex. The shadow behind the lattice of the pipe rooms caught my eye. The dark trim of the pews, the lattice framing the alter make a room-filling geometrical composition. I missed stained glass at first. Then I caught the light and shadows. The planes of the pews did their own thing with light. I wanted to hold on to the low winter sun. The aisles are monumental yet cozy, a comfortable route to your seat after the service has started. Altar and chancel are quiet and curvy, restrained but not simple. The exteriors are compositions in themselves. I'll return if I can. 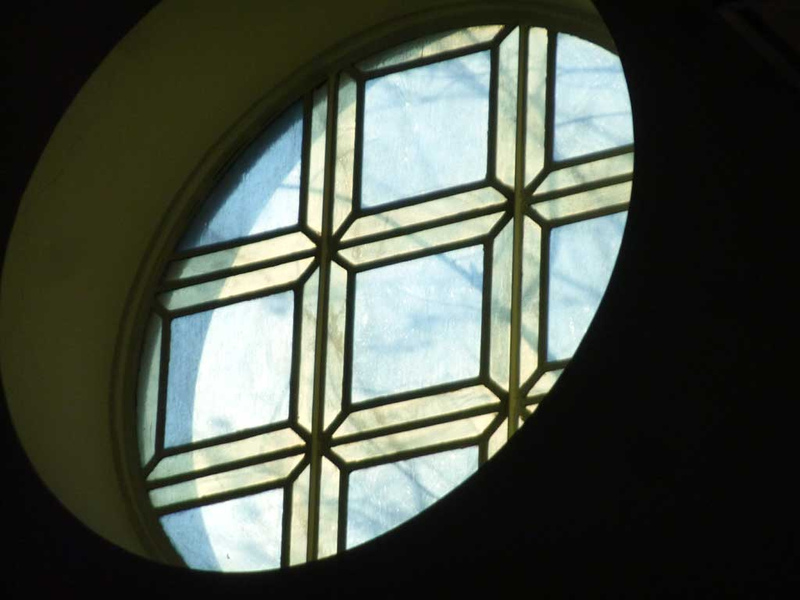 For now I'll leave you with a Crook cupola and Crook lattice as seen from the sanctuary. It's charm dialed to 11. While the tall steeple aims at heaven, it's the cupola that draws my eye. Thanks to Clark, to Trinity Presbyterian Church, and to their Friday men's breakfast. Thanks to William Robert Mitchell Jr. author of Lewis Edmund Crook, Jr. Architect 1898-1967: "A Twentieth-Century Traditionalist in the Deep South". Thanks to Jim Crossley, grandson of Lewis "Buck" Crook who publishes some of Crook's beautiful work on the web. An Architecture Tourist erratic is a building that differs from those native to the area in which it rests. Mayson Chapel Baptist Church is on Mayson Avenue near Plasters Avenue in the Armour-Ottley Industrial District. It sits atop the tallest hill. If it had a steeple it would be a landmark. Instead, it's unremarkable, nearly invisible, until you look. I've been fascinated by the Mayson Chapel for years. It's so out of place but still active. It alone remains from a prior era, alone among acres and acres of warehouses, parking lots, and railroad tracks. It could use some scraping but it's clean and well kept. Inside, it's ready for the next service. 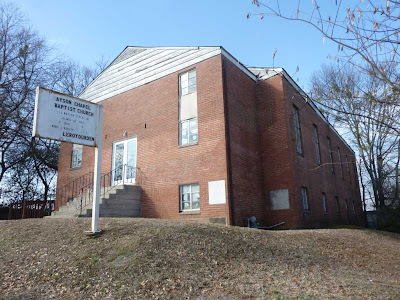 How many baptisms, weddings and funerals took place here in the last 87 years? It's pretty old, organized in 1909. The first cornerstone is from 1924. The second is from 1949, a few years before the industrial park. The community in this area must have been thriving and confident. In fact it was part of Benjamin Plaster Plantation. Slaves farmed cotton here and in Peachtree Hills. The Plaster home was across the creek just north of ADAC, probably visible from here in it's day. Here we are looking north towards the Buckhead skyline, across the bottom lands of Peachtree Creek. This certainly remained farmland even as the city grew around it. There must have been a thriving community at one time. For you Atlantans: imagine farmlands where Sweetwater, Mason Murer, and Classic Design Services now stand. The church is the only thing that remains from that time. This is from the top floor of the parking lot at City Center, looking south from near Piedmont at Lindbergh, the ADAC is just visible on the right. From nearly a mile away, zoomed to the max, it's obviously a church, standing proud but reserved. How did I find this to begin with when you have to go this way to get there? If you live in town and want to take you children to "watch the trains," this is where you go. Why "Plasters Avenue?" It joins the few blocks of Plaster's Bridge Road that still exist. Plaster's Bridge crossed Peachtree Creek just south of the current bridge on Piedmont Road. "A glacial erratic is a piece of rock that differs from the size and type of rock native to the area in which it rests." Henceforth, an Architecture Tourist erratic is a building that differs from those native to the area in which it rests. Finding great houses in Buckhead, Druid Hills, Inman Park, Ansley Park is like shooting fish a barrel. It's a great pleasure but not really a sport. If size doesn't matter, there are great houses all over Atlanta. Finding them IS a sport, a sport I dearly love, finding erratics most of all. 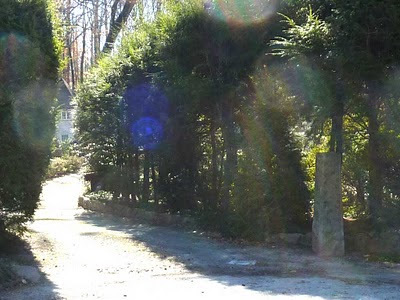 A modern in Druid Hills? I can only think of 4, one is effectively invisible except from the golf course. This erratic is a modern married to a tiny Greek tomb, perhaps from Oakland Cemetery. It's a shape I can't resist. There's a bridge to boot. It's not the sort of thing you see in Druid Hills. To my eye it's always a treat, always in flux. It's good sport looking for it. Email me for a hint. Later, turning for home from Decatur I chose to do Oakhurst because I can't resist the Neel Reid designed Solarium, then Kirkwood because Howard Avenue never disappoints , then Edgewood because it's streets aren't thoroughfares and I don't know them well, then ... well I'm getting carried away now. I turned down Wisteria for the first time. Among the very modest well kept ranchers, I found this neoclassical erratic. The shock faded quickly, the sensation was like finding a mansion in a small southern town. They all have a few mansions. There are several of these around East Lake and Kirkwood. I'd guess the original estate was subdivided in the 50's. By then the gentry was long gone to Buckhead. The Decatur - Kirkwood axis is amazingly flat for Atlanta. It makes for an uncharacteristically welcoming front porch, thus the "Keep Out" sign. The semi-circular side porch is charming. If the long dripping window unit is any indication, the house is long past it's salad days. But the roof looks good, the paint is pretty fresh. There's a big 1 story porch on the back. 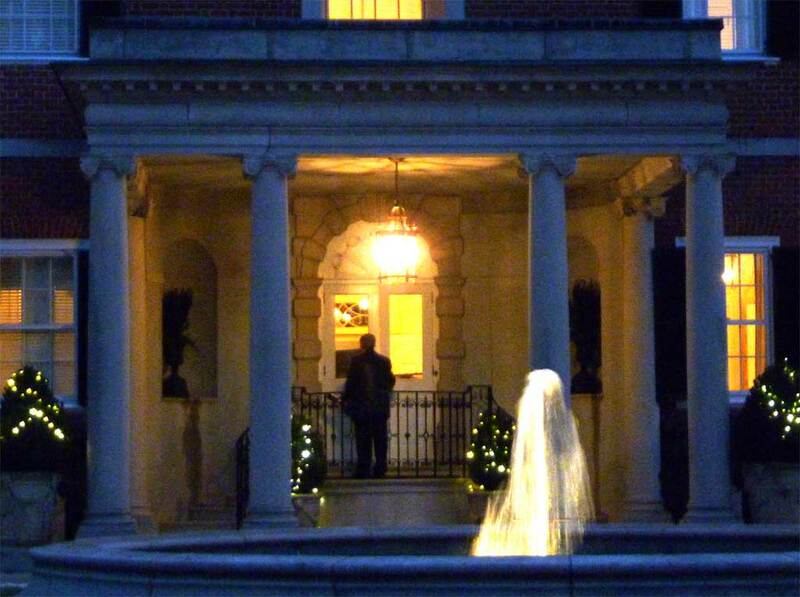 There I was at Knollwood across the street from the Governor's Mansion at the kickoff party. There were intern architects, folks who could own a home like this, and folks in between. Maybe I'm too sentimental: When you fill this house with people, you get joy. It's not just me, is it? I blogged about the 2o11 Shutze Awards 10 times but I don't think I convinced a single soul to attend. I blame myself. I'll try harder next year. I'm old enough to know better. I build these things up in my mind. It was my 3rd swing at the awards and I expected a lot. Blogging and enthusiasm got me an invite to the patrons' party at Knollwood on Friday night. I'm sure they'll correct that mistake once they know me better. Kicking off the Shutzes at Knollwo0d was just perfect. Designed by Hentz Alder, and Shutze, the Kiser family threw their first party in the fall of 1931. It's for sale so you can see the pictures here. Helen at Whitehaven declared it House of the Week. But real estate pictures don't cut it for a place like this. You should see this house full of people. These rooms make people feel important and comfortable and delighted. Are you on Facebook? 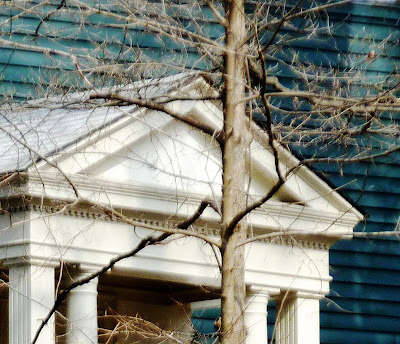 I promise some of the most beautiful places and interesting events in Atlanta: Please like the Southeast Chapter of the Institute for Classical Architecture and Art, the SE ICA & A.
I'd be honored if you like the Architecture Tourist on Facebook too. Here are the winners, the stars of the show, some of the most beautiful places you'll ever see produced in collaborations of owners, architects, designers, craftspeople, and engineers here in the South. Next: Part 2: the lecture with no test. Point: If you are a designer, design student or fan in Atlanta, take advantage of free programs at Georgia Tech. Extraordinary things happen there right under our nose. Now I know: Bjarke Ingels is an architect super star. He spoke at Georgia Tech yesterday to a standing room only crowd. Folks drove from Clemson to see him. Were there any folks from SCAD, Georgia State, ADAC, Emory? This 37 year old started with Rem Koolhaas. His own firm is BIG, Bjarke Ingels Group. He teaches at Harvard and Colombia yet finds time to turn Möbius strips into buildings. He can tell you how and why with a joke. He must be the best salesman in the world (better than the Nationwide guy on TV). His firm designed the Denmark Pavilion at EXPO 2010 Shanghai. They moved The Little Mermaid to the pavilion for the show. You can see her in this video as Bjarke rides his bike through the building from bottom to top to bottom. XPO - BJARKE BIKES THROUGH DANISH PAVILION from BIG on Vimeo. Bjarke's book is a graphic novel. "Yes is More" is part of his challenging yet humorous shtick, like a bicycle path inside a building. This could be his next book title. Now I know: Bjarke Ingels is the Total Package and I saw him for free on an ordinary Wednesday night right here in Atlanta. I shared the experience with a roomful of students who will be doing big things in the near future. Some may even read my blog. Maybe. 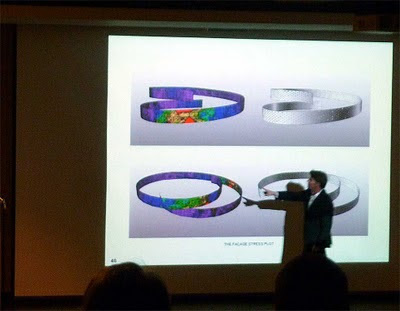 Thanks so much to Bjarke Ingels, and the Georgia Tech College of Architecture, and special thanks to George Johnston Chair, School of Architecture and to Ashley and Mike Bennett who made me feel especially welcome. Here are some sights from today's errands. Three churches and two houses caught my eye. Tips: Take your camera, don't worry too much about the words, look, and if you are driving, stop the car before you snap. 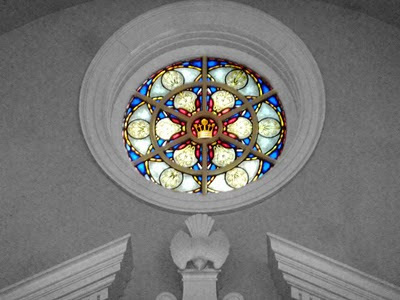 This tiny window is the only stained glass in the church. Very striking with the lights off this morning. There is a dove in the pediment. It's way up there and my little camera doesn't do telephoto details very well. Nonetheless those reds, blues, and golds really pop. At the Shutze's landscape architect John Howard (Howard Design Studio) told me he was working on a house by architect Rodolpho Castro in Ashford Park. Hey' it's on my route. Masons were staging the over-sized brick for the front facade. It's a departure from the typical tear-down in the neighborhood. On the right a potential tear-down, on the left a "done" tear-down. How modern will Rodolpho's house look? I can't tell you why but I loved the morning sun on the south facade although my camera didn't pick up much of the beautiful brick. I'd done Morningside then Oglethorpe, now to Decatur. I've already showed you "National I-house is getting a modern T-Bone in Decatur." Today the front door was open and the inside glowed. There's a front to back enfilade. The lights are OFF!!! They don't call the architects "Lightroom" for nothing. I chose a trans-Kirkwood / Edgewood / Candler Park / Druid Hills route next. First "The Mansions of Howard Street" then a cruise by the Edgewood Community Garden. There is a hilltop west of the Gardens. I spotted a little cross. It's on the way, why not? Here it is. These sturdy little churches are all over the city. You don't have to be a cathedral to have stained glass. After a jog downtown I headed north to the Mt. Paran/Northside area. On the way home I snapped the beautiful steeple looking it's best from West Wesley. Good grief, some of the urns are missing. Looks like I'm getting spots in my pictures. Is the camera still under warranty? Shutze's "Ferst House" is a fairy tale castle. I went the 2011 Shutze Awards last night, at the Piedmont Driving Club, me and about 400 of my best friends. More on that later. In the meantime congratulations to the winners and to architecture tourists everywhere: Folks want to build beautiful places and the talent is here to do it. People left HAPPY. Oh, Phoenix Flies is coming. Click the link up there. The very best thing about the Shutze weekend is meeting fellow enthusiasts when they are in the mood. I found Wright Marshall and I asked if he knew anything about this house. Without hesitating Wright said, "It's a Shutze House and it's in the book." The neighborhood is a house museum. Yet this house, barely showing some ankle, seduces in a glance. It was love at first sight for me, more than 30 years ago. Thing is, you really can't see it, only Zen views, even in the winter. Tall bushes line the curving gravel driveway. Something is there, the rough-hewn flattop obelisks give it away. So you slow down, creep past the driveway. There is something up there. It's the "Monie Ferst House" 1929 by Philip Shutze. "It may be his only design in the style." American Classicist: The Architecture of Philip Trammell Shutze by Elizabeth Meredith Dowling pp 138 - 139 has the plan and elevation. Drive a bit past the driveway to catch another glimpse though the trees. There is a tower with a curvy roof. Hat tip to blog serendipity. Fellow Architecture Tourist and architect Tom Matthews from Denver wrote Holly at Things that Inspire. (Tom's an architect, not me.) Tom's friend Dewitt Petty must be an AT after my own heart, a long distance house stalker. He'd found a picture of the Ferst house and wanted to know more. Holly referred Tom to me. Here we go: Dewitt > Tom > Holly > Terry (me) > Wright > me > Facebook > Tom, Holly, James, et al > Dewit > Architecture Tourist. Philip Trammell Shutze moves us 80 year later. A 1929 French Normandy bends web-space and time. Your sentimental host is grateful. I'm going the 2011 Shutze Awards tomorrow, February 12, at the Piedmont Driving Club. You should too. In the meantime a handful of urns from Shutze designed buildings. 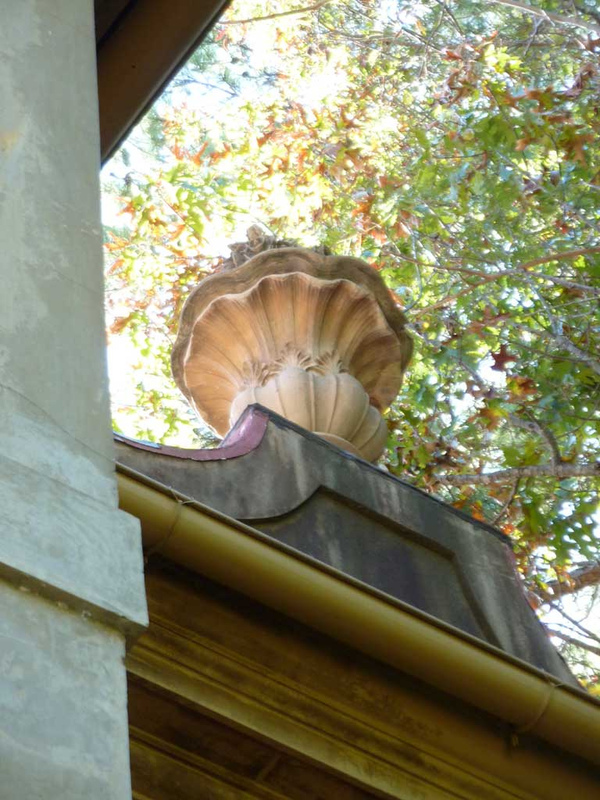 This urn "on location" at the Andrew Calhoun House (1919-23) The Pink Castle is not quite as big as a refrigerator. The Grady High School Urns in 2 by 2 formation. The stumpy Crawford-Long hospital urns. There is a whole family of urns living on the Glenn Memorial steeple. The urns overfloweth at 969 Peachtree, the Peachtree Manor Apartments. Not exactly an urn a top the Haygood-Hopkins Gate at Emory. Half an urn is better than none at Harris Hall. And at the KA House.